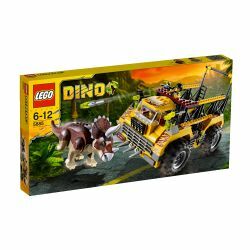 5885 Triceratops Trapper is a Dino set released in late 2011. It includes a huge truck with flick-fire tranquilizer missiles, tranquilizer guns, spikes, and a large cage in the back to put the dinosaur in. It also includes two minifigures and a Triceratops. 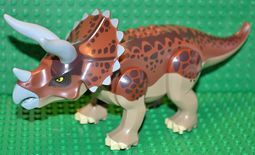 This set comprises only one model, along with a model of a Triceratops dinosaur, as is the tradition with this theme (a Dino is included in every set). The vehicle is a fairly large 4WD with a dinosaur prison located in the back of the truck. In the front of the vehicle, located on the bumper, are spikes, as well as the engine's grilles. Outside the cab near the driver's seat, are two double flick-fire missile launchers. Lining the exterior of the side portions of the truck are black coloured fence pieces, forming the walls of the cage. Clips for holding personal tranqualizer guns, as wel as extra darts, are featured between the wheels. Gate parts which fold downward are located in the back of the cage, which assists in moving the dinosaur in and out of the "prison". Two red brake lights are located high up over the top of the cage. The Triceratops Trapper is a vehicle whose sole purpose is capturing the Triceratops dinosaur. To capture it, the "heroes" can utilize their flick-fire missiles located on both sides of the front of the truck. Once the Triceratops has been tranquilized, they load the creature in the rear of the truck, and take it to the headquarters. This is the only Dino set that has a non-carnivorous dinosaur. The triceratops and Tracer Tops are exclusive to this set. Tracer Tops' name is derived from that of the dinosaur included in this set, a triceratops. This is a description taken from LEGO.com. Please do not modify it. (visit this item's product page) Cage the Triceratops and keep the city safe! The mighty Triceratops is on the rampage and headed straight for the city! Fire the tranquilizer weapons, lure it into the cage and load it onto the truck before it reaches the city and causes mayhem! Includes 2 hero minifigures and a Triceratops dinosaur. Capture the Triceratops in the cage! Load the cage onto the truck! Facts about "5885 Triceratops Trapper"
Cage the Triceratops and keep the city safe! This page was last edited on 29 April 2016, at 16:43.